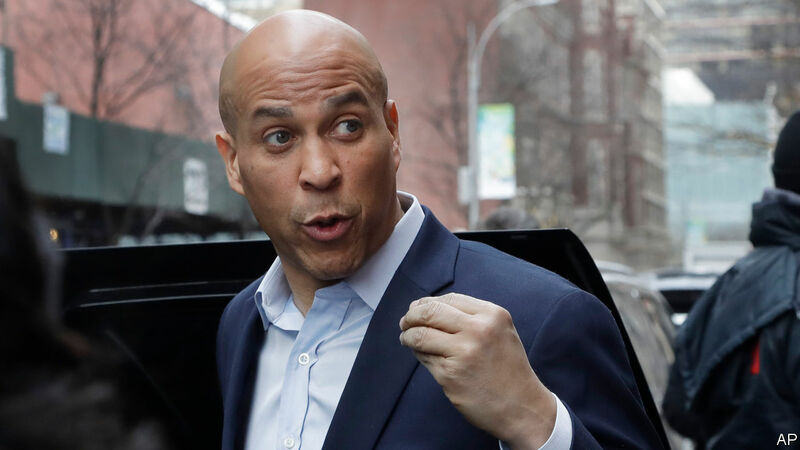 IF LOVE really does trump hate, as grief-stricken Democrats assured one another after the 2016 election, Cory Booker has an excellent chance of becoming president. The senator from New Jersey talks about love—or “unreasonable, irrational, impractical love,” as he once put it—all the time. Following his long-anticipated entry into the Democratic primary contest on February 1st, he is also now running on it. Not many people have tried that before. Mr Booker, a multi-talented 49-year-old—not many Stanford football stars have gone on to Oxford and Yale Law School, either—is in part channelling the activist church tradition of Martin Luther King and other black politicians. A devout Baptist, whose Senate office is lined with books on religion, he held a pre-announcement prayer service at his local church in Newark. His call for mutual understanding also positions him closer to the political centre than most of his early rivals for the Democratic ticket, such as senators Kirsten Gillibrand and Elizabeth Warren. It is, in Mr Booker’s florid preacherly style, essentially a call for bipartisanship. “There’s a lot of pain out there in America and a lot of fear and no party has a monopoly on that hurt,” he said, following his announcement. There is a lot to like in Mr Booker’s approach—and indeed in the man himself. Despite his elite education, he started in politics near the bottom, as an activist-organiser. After winning a seat on Newark’s municipal council, he briefly lived in a tent and staged a 10-day hunger strike to protest the chronically-depressed state of the former factory city. His love of the grand gesture is easily mocked. As mayor of Newark he was known for personally apprehending a criminal and rescuing a neighbour from a burning building. Yet his mayoral record was pragmatic and admired, including by business types; he persuaded Mark Zuckerberg of Facebook to donate $100m to improving Newark’s failing schools. That background—and the fact that he has received hefty donations from Wall Street—makes him a slightly suspect figure to the left-wing activist crowd. His voting record, one of the most liberal in the Senate, and rather wearing recent grandstanding against Trump nominees in the Senate Judiciary Committee, might be viewed as an effort to placate them. Mr Booker has inevitably invited comparisons with another former organiser and black senator, Barack Obama. And indeed, his likeliest path to the Democratic nomination looks similar to the one Mr Obama trod. Mr Booker will try to woo mainstream Democrats with his uplifting, somewhat moderate, rhetoric, in early-voting Iowa and New Hampshire. He will then hope to knock if out of the park in South Carolina and the other heavily-black southern states that follow. He could do it. There is no clear front-runner in the emerging Democratic 2020 field, and Mr Booker, on his day, is an endearing and impressive figure. There are also one or two reasons to think he might struggle. The obvious one is that Democratic voters do not love Mr Trump and may not wish to hear that Mr Booker does. This will not be a healing election: even voters tired of beating up on Mr Trump may find Mr Booker’s happy talk unconvincing. In addition—and unlike Mr Obama, who downplayed his moderate instincts behind a hopey-changey message (to paraphrase Sarah Palin)—Mr Booker has signed up to some pretty left-wing policies. He is for Medicare-for-all and a federal job guarantee, for example. This may turn out to be what mainstream Democrats want. It could also make him hard to distinguish from the cluster of other left-wing candidates—such as his fellow senators Mrs Gillibrand and Mrs Warren—especially if a compelling moderate enters the race. That would in turn make it harder for him to emerge as the black champion—a status Mr Obama assumed in 2008 only after he had won Iowa. And Mr Booker already faces stiff competition for that mantle from Kamala Harris, the first non-white senator from California, which will also vote early in the cycle, and maybe also Mr Obama’s former deputy, Joe Biden. In such a crowded field, in truth, each candidate’s claim needs to be treated with caution.